A budget tracker is a key planning tool in the armoury of marketers, be it for a small start-up business or a large multi-national. We have designed this budget template to be suitable for startups, small and medium businesses looking to refine their budgeting processes as they expand to include a comprehensive range of investment categories for Modern marketing including both online and offline channels. It could also be suitable for larger businesses to review your approach. It has been used in all these situations for different types of businesses by the authorl. You can use it for setting up a budget 'from scratch' or for reviewing your budget categories you have created for the year ahead - to avoid any 'nasty surprises' and embarrassing conversations in the year ahead with your boss or finance director. What does the Excel budget spreadsheet contain? We have three different versions - (British pounds, Dollars and Euro currency) of the spreadsheet available in a Zip file for marketers working in different currencies. These can be modified if you don't work in these currencies. Running successful marketing combining both online and offline channels to reach and influence your audience requires excellent planning. Budgeting is a key part of this to ensure you’re investing in the right marketing activities to get the biggest possible impact. Failing to model costs and track spend against target will mean you’re ‘marketing in the dark’ and will be unable to be flexible during the year or campaign. Getting budgeting right isn’t easy since you have to devise the right set of activities to track spend in and group them in such a way you can see the big picture. This set of spreadsheets will help you create a well thought out budget and track your spend across the year. It can also serve as a checklist to ensure you’ve considered and planned for all the key channels and media available to you. 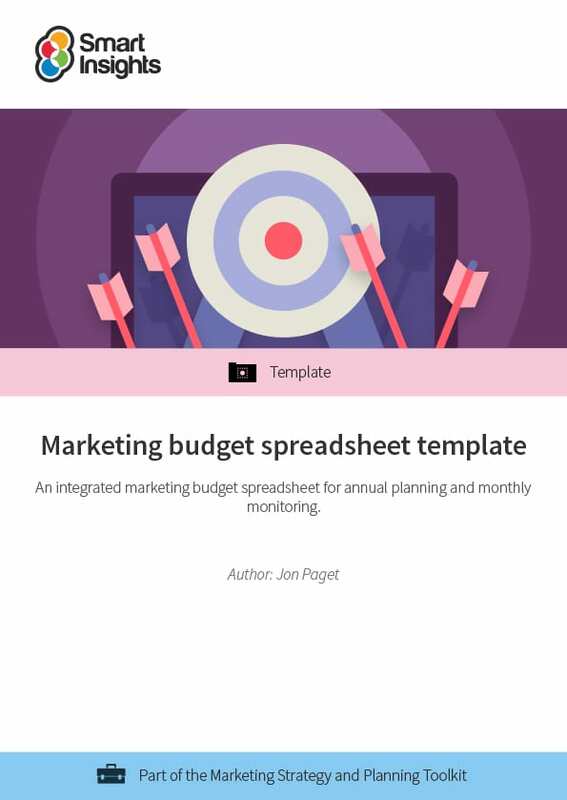 Of course, there are other free budgeting spreadsheets available online, but they’re often too simple to reflect the reality of running modern marketing activities AND they haven’t been created by marketing professionals. 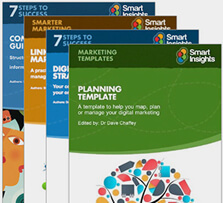 Format: Single summary worksheet you can use on its own or as a roll-up of 8 Excel worksheets covering all modern marketing activities. We have defined around 100 types of spend/investment needed by the modern marketer to give a comprehensive coverage to manage budget investment, but each is optional, so can be left blank if you don’t use it. Companion spreadsheets: Digital Marketing planning spreadsheet – a conversion model spreadsheet to define target online visits leads, sales, revenue and profit.